I like to go bare foot. One of my first jobs I loved involved standing on a beach. There comes a day in each year as the leaves begin to flame red, orange and purple, that it becomes inappropriate for me to wear my thong-type sandals to work so that I can kick them under the desk if I so desire. That day this year? Yesterday. 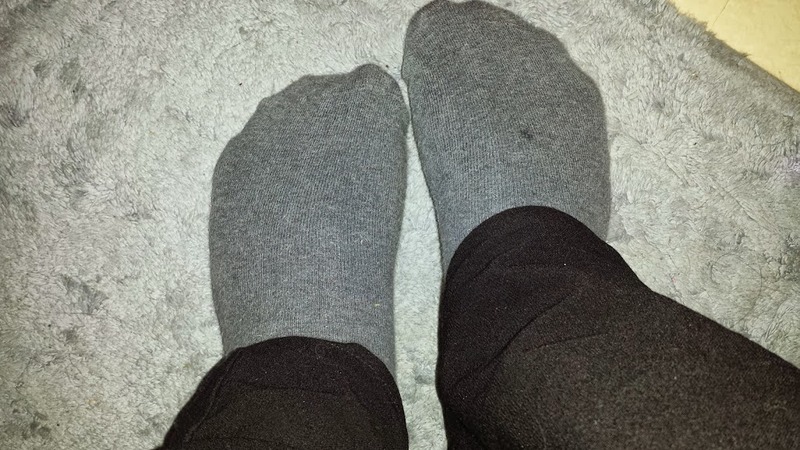 I woke up and the weather report on my favorite station showed a temperature that was not to my liking - I was going to wear comfy pants that were "skinny" style and knee-hi socks would be a comfort challenge. I knew I needed socks as I also wanted to wear my red clogs - despite the fact I love bare feet (feeted?) I hate to be chilly! Unfortunately for me - my sock drawer is mostly knee-hi's and footie socks used with my sneakers. There they were. A pair in a color that worked, that would not show my ankles and would not go up past my lower calf. But, huh? I do not recognize these socks at all. Did the sock fairy bring them? No, that is stupid. There is no sock fairy. Right? Are these yours? And if they are, can I keep them? We still have flip flop weather here, thankfully! I doubt we will for much longer though, as the days are starting to get a bit chillier. Those socks do look rather comfy!